This week, I had the amazing experience to attend the Moana Press Junket in Los Angeles, which included the Red Carpet Premiere of the movie, as well as interviews with Dwayne Johnson & Lin-Manuel Miranda (those interviews are coming net week on the blog!). We also had the opportunity to screen the movie twice. Here are my thoughts and why I think Moana is a movie for everyone. Last week, I pointed out the Moana movie poster to my 7-year old son while at the theater and asked him if he would go see that movie with me, even though it was about a princess. He looked at me funny and corrected me, claiming the above statement. While Disney certainly is doing a great job marketing, I was proud that he could see from just a few trailers that this movie was for all kids – girls AND boys. Because that’s the exact impression I walked out of Moana with when I screened it for the first time – Moana may be Disney’s newest Princess, but she is a heroine throughout the movie. The movie follows Moana on an epic oceanic journey 2,000 years ago. Her ancestors once traveled the world by a system of navigation called wayfinding, where voyagers look to the ocean currents and stars for guidance. But their way of life mysteriously ended — a plotline based on real Polynesian history. Moana shares her ancestors’ draw to the water and sets out to restore this integral part of their culture. In order to do so, she must find a demigod, played by Dwayne “The Rock” Johnson, and deliver him across the ocean. Moana is headstrong and determined to face this unbelievable challenge, despite everyone telling her not to go. She has this inner voice that pushes her to go after her dreams. Isn’t that what we all want for our children? For them to pursue their dreams, no matter what obstacles lie ahead of them? There were several times where Moana could have given up, yet she continued to push on in her journey. I am so encouraged by this story and can’t wait for my children to see it. We need more examples of heroines like this for kids to see on the big screen. Yes, Moana is beautiful and has an unbelievable singing voice – she makes for a perfect princess – and I am very happy for Disney to add a princess of color to their group as well. But more importantly, Disney has done a great job of making these characters head-strong and determined and placed them in a story that grabs the attention of both girls and boys. As a mom of boys, I was thrilled that my son recognized that Moana was a hero and didn’t just look at her as a princess. It’s a terrific start in changing the way our children are raised to view women – as independent, strong and successful – and not just sitting helpless in a castle waiting for her “prince” to rescue her. Lin-Manuel Miranda. Need I say more? Yes. There is MORE. Disney worked hard to make sure the movie reflected the Polynesian culture as well as they could, even taking several trips to the Pacific and working with several groups to ensure it’s accuracy. They found musicians from the islands that had beautiful music and they collaborated to bring the authenticity the movie needed in it’s score. Opetaia Foa’i is a Samoan artist who worked with Broadway genius Lin-Manuel Miranda and Mark Mancina (Tarzan & Planes) to create an absolutely beautiful score for Moana. Filled with log drums, chants and more, the music immediately draws you into the movie. The original songs are catchy – Maui’s “You’re Welcome” includes a rap by The Rock that will have you singing it for days. But the song that gives me chills, “We Know the Way“, is beautiful and comes at a perfect moment when Moana learns more about her ancestry. Here’s a performance of “We Know the Way” by Foa’i and his band Te Vaca at the Moana World Premiere. I love Miranda’s work, but the collaboration with Foa’i has left a beautiful imprint on the movie. It already was a terrific story but the music just finishes it in such an amazing way. I can’t wait to see this soundtrack do well – I’m predicting Frozen-esque success here. In true Disney fashion, the movie begins with a terrific short. Inner Workings is a simple story about the struggle between what the heart wants and the brain thinks it wants. We get to take a peek inside of “Paul” who lives a pretty doldrum life, working a 9-to-5 job with little to no excitement. We watch as the heart is tempted to try something new and live a little and the brain cautiously say no to everything. Without giving too much away, this adorable short is heartwarming and challenges us to take risks and enjoy life more often. While at the press event for Moana, we had the opportunity to hear from the Producer Sean Lurie & Director Leo Matsuda of Inner Workings and learn how the story was created & evolved. 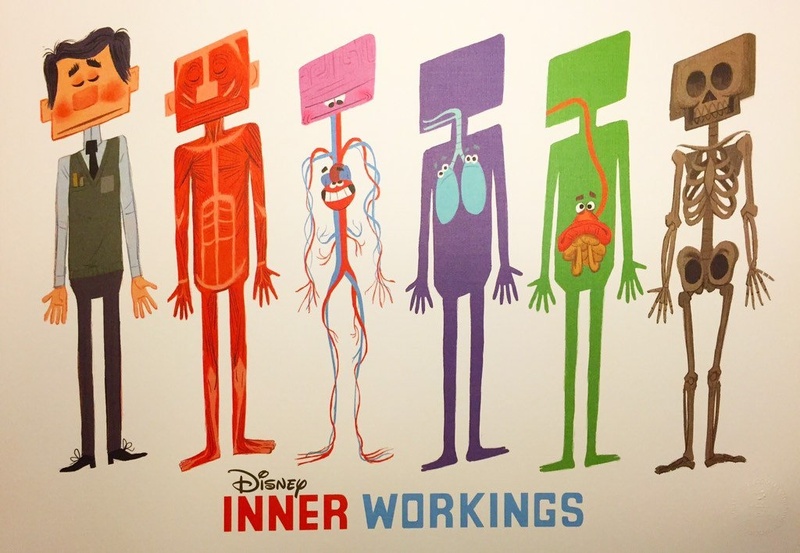 Inner Workings is a fun way to start Moana. It’s so fun to have this little bonus movie to look forward to seeing as well. As you can tell, I absolutely loved Moana and I highly encourage you to take the whole family to see it over the Thanksgiving break. It has something for everyone – the story is great, the humor is fun for kids & adults, and the music will have you bopping in your seat. It’s a fun way to spend time as a family. Enjoy!